Chinese cabinets are broadly divided into two classes, the round cornered or the square cornered. As the names suggest, square cornered cabinets have sharp edges and the doors are supported by hinges, mostly like the cabinets we use today. Round cornered cabinets are more curvaceous and the doors are supported on 'fulcrums' or wooden angles, and most of these doors are removable. The doors in a round cornered cabinet can be adjusted to “fit” as such into the frame of the cabinet, giving it a neat look. As suggested earlier, the Chinese are greatly influenced by the art of Feng Shui and thus, most of the cabinets are places in pairs, usually adjacent or at some distance apart from each other, with a table or another piece of furniture in between. This arrangement offers great aesthetic sense to the whole outlook of the room as well. Cabinets in China are mostly used as wardrobes, but without the hanging 'space', as in china, and most of the Asian countries, people prefer laying their clothes flat rather than hanging them. Most cabinets have a hidden storage space, at the back or the bottom, covered with a removable shelf or cover. Infact most of the cabinets have removable shelves, which allows the consumer to adjust the storage area according to the needs. As mentioned earlier, the Chinese like to keep their furniture simple and chaste in design, and this is visible in the design of their cabinets as well. Mostly they are lacquered painted, with embedded stones or brass designs and the underlying wood is highlighted. At times you may also find the whole furniture set i.e. cabinets, chairs and tables, designed to a particular landscape theme. In northern regions of China, due to excessive cold conditions, there is a central part in the homes, usually made of brick kiln, which is used to keep the house warm, much like the western chimneys. Most Chinese dine around this area, and many low surface cabinets served as a dining table and place to hide valuables. 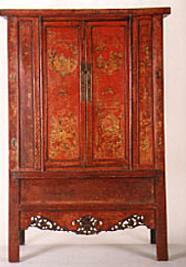 The cabinets were camouflaged as tables and had secret compartments, where the Chinese kept their valuables. The hinges, knobs, handles and door locks of these cabinets are usually in brass, and are considered good from the point of view of design as well as Feng Shui, as this combination, according to the masters of Feng Shui justifies the harmony of wood (nature) and metal (artificial). The cabinet designs unfold old mysteries, giving rise to new ones, taking you into a whirlpool of aesthetics, functionality and synergy.